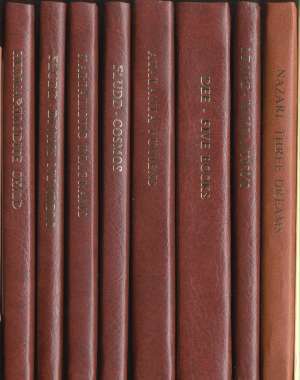 This series of limited edition hand-bound books by Adam McLean were initially produced between 1979 and 1986. They were never sold through book dealers, but only by direct mail order. Consequently, these books became collectors items, often fetching high prices on the second-hand market. Only a few copies remain of some of the older titles in this series and a number are now entirely sold out. Since 1997 seventeen new titles have been issued with more in preparation. Those who have read many alchemical texts from the late 16th and 17th centuries will often find they reference the work known as the Scala Philosophorum as a source of ideas. This work appears to have been written in the early 15th century by Guido de Montanor and came to greatly influence later authors. It was one of the ealiest works to present a systematic order for the alchemical processes - Calcination, Dissolution, Separation, and so on. George Ripley's 'Twelve Gates' were modelled on its structure. Guido de Montanor articulated in his 'Ladder of the Wise' a sequence of alchemical processes to be followed in order to attain the ends of alchemy and which became the accepted canon for some hundreds of years. The text from the first printed version of the Scala in 1550 has been translated from the Latin by Ingrid Walton. Limited edition of 200 signed and numbered hardbound copies. A5. 56 pages. Price includes £3 postage and packing.